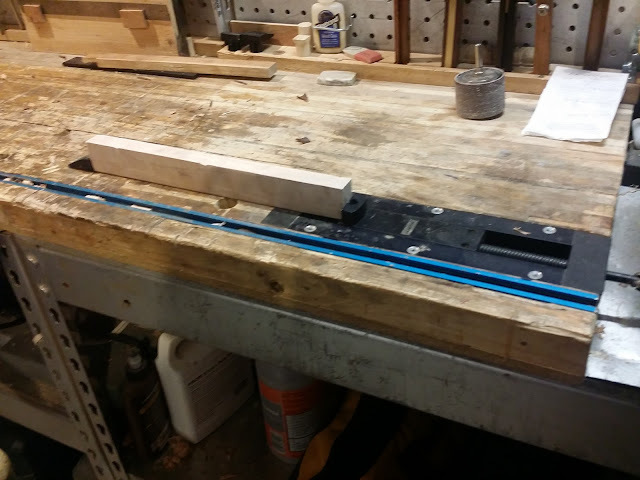 Last time, I mentioned various workarounds for not having a tail vise. Well, scratch that. Now my workbench has a tail vise...sort of. A tail vise is very handy, but not essential, for holding stock when using handtools, especially planes. 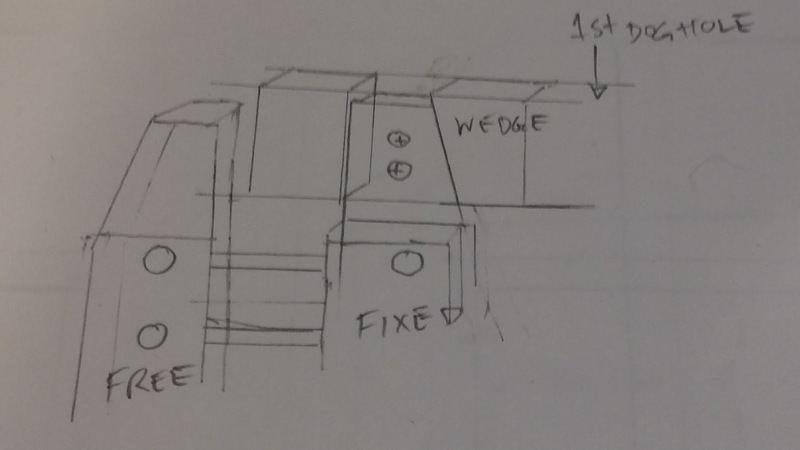 A few days after my last post showed the various workarounds for not having a tail vise, I ran across a copy of Woodwork Magazine from October 1996 describing an easy alternative to a traditional tail vise using a wooden screw clamp. 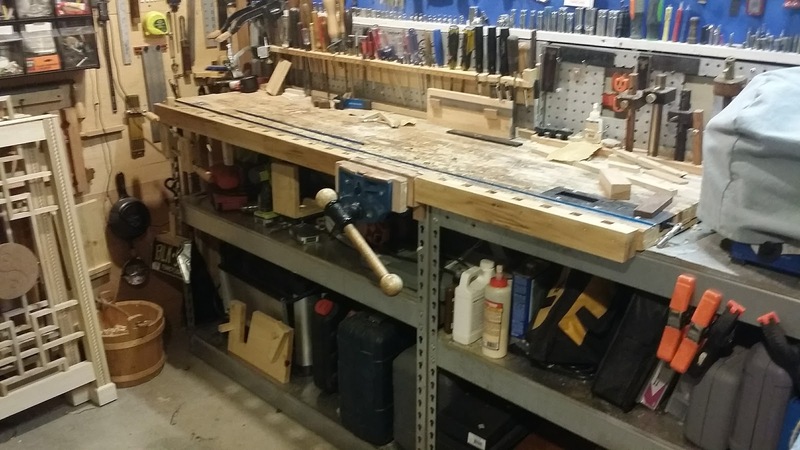 My bench is bounded on the left and the right by walls, so there isn't enough room on the ends to allow for a real tail vise in my tiny shop. 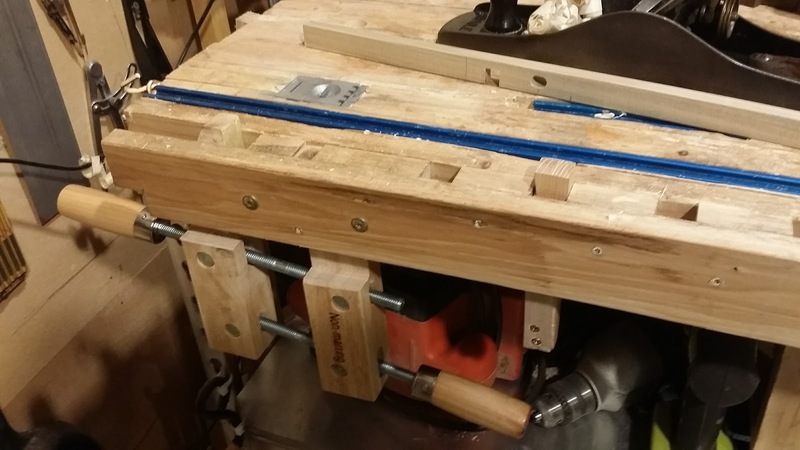 The alternative tail vise and dog holes can be fashioned together in an evening. Instead of a traditional tail vise which moves in and out on the end of the bench, this "tail vise" uses a simple wooden screw clamp along the front of the bench as its mechanism. One part of the screw clamp is fixed in position (see diagram below), while the other is free to move up and down and back and forth. The clamp can be as wide as the biggest clamp that you can find (needing larger accompanying dog holes), if desired, but I opted to use a fairly small clamp and even narrowed the width of the clamping portion to 3/4" by rip cutting away some of the thickness of the working ends of the clamp. The tail vise normally would go on the right side of the bench for right handers, but my sharpening station would have been in the way. With any tail vise, you would need dog holes. 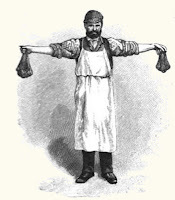 These were fashioned out of hickory (since I had plenty of that), but ash or maple would be fine. The distance of each block between the dog holes plus the dog hole length should be a tad less than the span of the clamp. I am suprisingly pleased with how solid and how well this clamping system works. I would like to have the threads on the clamp not be so fine to speed up the clamping process a bit. The heart of the "tail vise" is a simple wooden screw clamp. New tail vise and dog holes. 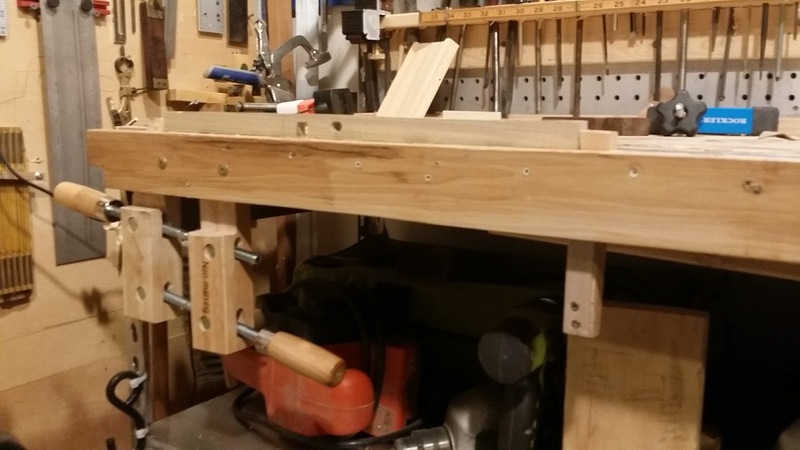 The workbench is bounded by walls preventing the use of a traditional tail vise. Spaced blocks were glued to a board with screws then going through the front board, each block and into the front edge of the workbench. This is a rock solid configuration. The front vise, while not in a traditional location, needed to stay there since placing it on the end of the bench would limit its use due to adjacent walls. The fixed portion of the front vise is just a tad proud of the add-on dog hole apparatus. If my stock happens to land where the front vise is located. I use a right angle block placed in the front vise. Fixed portion of clamp is held in place by stright and angled blocks plus screws. Workbench before dogholes and "tail vise" added to front of bench. I had used an inset tail vise from Lee Valley that takes longer to set up for clamping and is not height adjustable. My new home made tail vise is much more robust for clamping.